It’s finally here!! I am so excited… and here’s why! The Jenna in question here is the writer of Jenna’s Everything Blog. She and her husband, Adam, live in Chicago and are expecting their first baby, Alice, quite soon. When Veronica of Veronica’s Cornucopia emailed me a few months ago to ask if I wanted to be part of a virtual baby shower for Jenna, I didn’t have to think twice! I’ve been reading Jenna’s blog for quite some time… delighting in her tasty recipes [like these no-bake peanut butter cup bars that I blogged about last summer], eating up her awesome book reviews [she loves the Christy Miller books, which I adored growing up], loving her amazing photography skills [like these Chicago photos], and exploring all the other areas of the “everything” portion of her blog. Including the little fact that Jenna and her husband graduated from Indiana University, where I currently am a graduate student! Woohoo! Anyways, even though I’ve never met Jenna in real life, I am convinced that she and her husband will be awesome parents. They love the Lord and will raise their daughter well… and we are all excited to be able to honor her today! For the occasion, I decided to make Iced Tea with Ginger-Mint Simple Syrup. I normally don’t take the time to make “special drinks,” but showers are the perfect time to deviate from the norm. 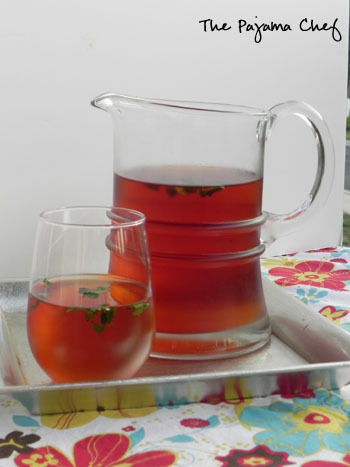 This Ginger-Mint Iced Tea is a simple, subtle, elegant drink that is a perfect compliment to any party, occasion, or plain ‘ole everyday refreshment. I made it by infusing a basic simple syrup with lots of fresh mint and ginger… a painless process that I can see myself doing time and time again to flavor my iced tea [or even lemonade] on a regular basis. The advantage to sweetening tea with syrup rather than straight-up sugar is that liquid dissolves more easily in liquid… who knew? It’s a breeze to stir this syrup into iced tea to your taste preference [I used 1/4 cup for a quart]. Speaking of preferences, I typically make iced tea with cold brew tea, but feel free to use whatever method you prefer. That’s the beauty of beverage recipes… they are super flexible and hard to mess up. Always a good thing, if you ask me. 🙂 And speaking of good things, don’t let this recipe be the only stop at the virtual baby shower. Be sure to check out the other recipes from Jenna’s other wonderful blog friends, posted below the recipe. 🙂 Enjoy! In a small pot, combine 1 cup water, sugar, mint, and ginger over medium-high heat. Stir continually until sugar dissolves–about 4-5 minutes for me until sugar was really dissolved, then reduce heat to low. Simmer for 3 minutes, stirring occasionally. Remove from heat and let steep for 20 minutes. While simple syrup is steeping, prepare iced tea. Combine 1 quart water and tea bags in a large pitcher [mine is probably ~1 1/4 quarts] and let steep for 8-10 minutes, or until tea is brewed to desired preference. Place in refrigerator to chill. After syrup has steeped 20 minutes, pour syrup through a fine strainer into a large measuring cup or bowl. 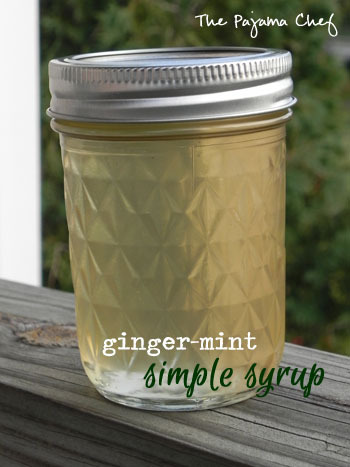 Refrigerate syrup, strainer and all [to catch any last lingering drops of syrup caught up in the mint and ginger]. After tea and syrup have chilled, stir in syrup to taste. I used a generous 1/4 cup and found that plenty sweet for me, but it was nowhere near Southern sweet tea so if that’s your thing, use more. Store extra syrup in a covered container in the refrigerator for up to a month. City Songbird (Greensboro, NC): Merry Christmas, Alice! A virtual baby shower! So fun. I had to stop by and tell you, Sarah, that I LOVE the sounds of this iced tea! Ginger is one of my favorite ingredients to work with and the mint makes the whole glass seem so refreshing! Perfect for a shower! I’m a MAJOR fan of iced tea to begin with and I feel like when you add ginger and mint it only has to get better! The perfect beverage for the shower! thanks joanne! and the cool thing is… my sister’s bridal shower is next weekend so i think i’ll actually make it for an in-person shower too!